A year ago today I was elated, exhausted and overcome with many, many emotions. 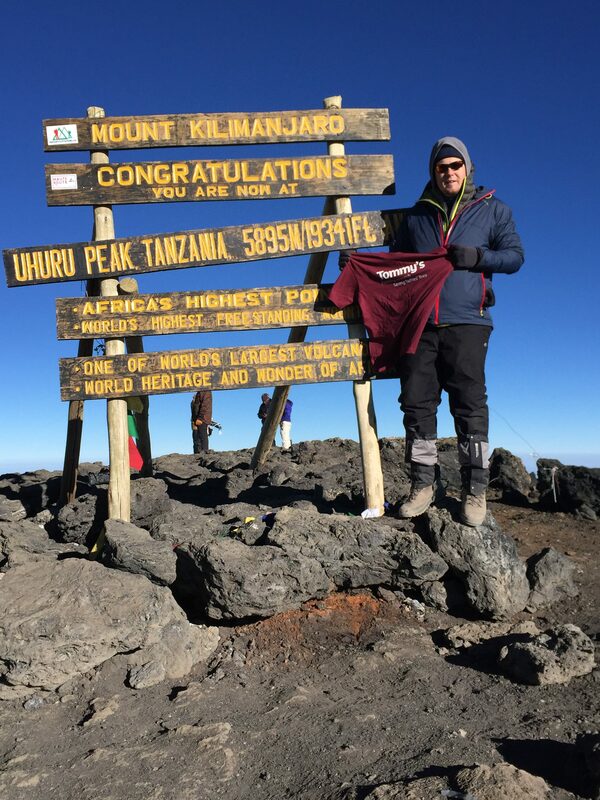 I had just reached the summit of Kilimanjaro after a gruelling hike through the night in freezing temperatures where all my body wanted to do was sleep! Seems a little unbelievable if I’m honest. As I sit here in the comfort of my chair with the familiar background noise of children playing, it feels a little like it never happened. Just a brief encounter with a distant memory. But then the memories of the trip come flooding back in a rainbow of dazzling colour! I remember the nervous excitement in the run up to the trip. The laughter, tears and games played out with the group I climbed with. The effort of training to try and prepare for what I was going to do. The self inflicted pressure of trying to reach my fundraising target. The tribulations of snapping an achilles a few short months before! But most importantly the biggest memory I have is of standing at the summit, breathing in the surroundings, the view, the achievement and the feeling of standing on top of the world. Absolutely! Without hesitation. 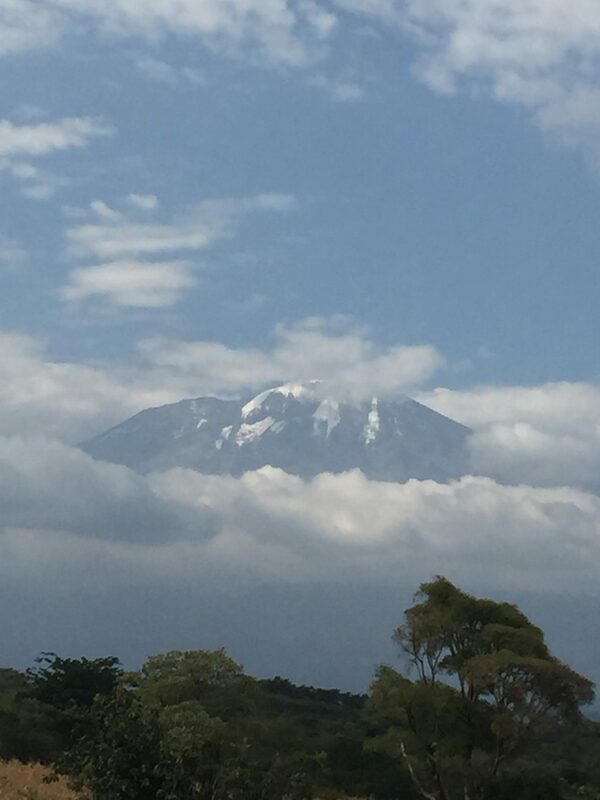 In fact I quite often think about my time climbing Kilimanjaro and in some ways wish I was there right now climbing again, experiencing everything the mountain throws at you. Will I do it again? I hope so, but I don’t know. Maybe when my girls are older. Who’s know’s maybe Beth will do it with me?! My lodge at the Moivaro Coffee Plantation – excuse the stuff all over the bed! Me smiling…little did I know! We made it to Stella Point! What animal do you see here? This time two weeks ago I had just conquered the hike up to Uhuru peak and endured the scree surf back down to camp. Now pretty much fully recovered – although the tips of my big toes still lack full feeling! – I can look back on that day and the entire trip with a feeling of elation and a sense of true achievement. I’ve regaled stories to friends and family many times, gazed with wonder at my photos and photos from others in the group, bored colleagues by using words like “amazing”, “challenging” and “brilliant” over and over again, and I’m dumbfounded at the genoristy of everyone who has helped me raise money for Tommys; while I haven’t yet reached my target, what has been raised is fantastic and will help enormously. I have been asked by quite a few people what the next challenge might be. 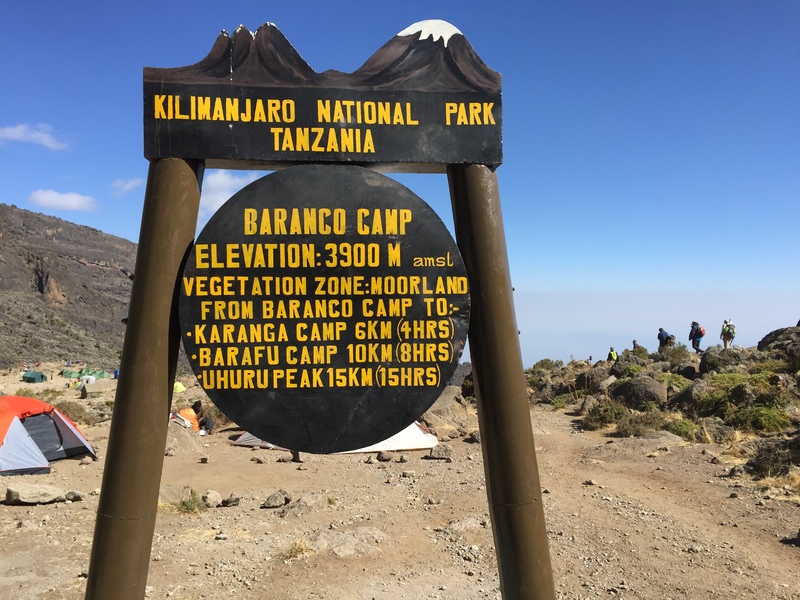 Some have suggested Everest Base Camp – Kilimanjaro’s Uhuru Peak is actually a higher elevation than base camp by 515m, so what’s the point?! 😄 I’m not entirely sure if there will be another challenge (or if I’ll be allowed to do one! ), time will tell…although White Water Rafting trip down the Colorado river in the Grand Canyon does sound like fun! 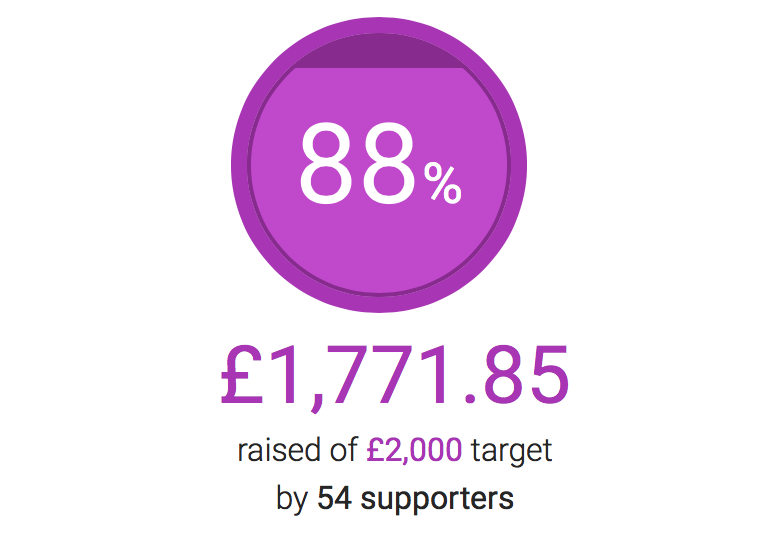 If you would like to donate and help me raise money for Tommy’s (and maybe reach my target!) there is still time. Just visit my JustGiving page here. If you look carefully you’ll spot me…behind the sign, to the left and below the ‘Congratulations’. No idea why I decided to hide! 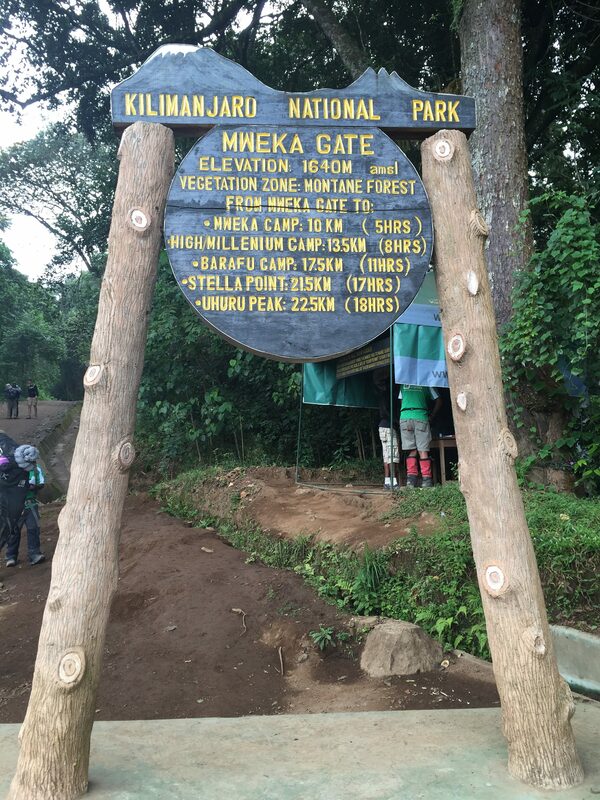 Day 8 – To Mweke Gate: End of the Climb! Wake up call and washy washy at 06:00. Breakfast at 06:30 – porridge, toast, sausage, egg and watermelon. Quite a few moans and groans from the 20+ hour day yesterday; lots of excitement about returning to Moivaro Coffee Plantation and the thought of a shower and a proper bed! Tipping ceremony started just after 07:00. John very kindly stepped forward and said a few words for the group and then a nominated person (porter, helping porter, chef assistant, chef and assistant guide) stepped forward to receive the tips for their group. Much happiness amongst the porters as I think Makeke said something about the maximum amount being given?! A few songs from the support crew and much enjoyment from all and then we were off. Down from 3287m to Mweke gate at 1633m which took around 4 hours. Sign out at the bottom and then a 15 minute walk to where the bus is. What I wasn’t prepared for was the small children, no older than Marlee still in school uniform, who run out to see you with big brown eyes, faces of pure innocence and amazing smiles shouting “Jambo” and then utter one word that almost broke my heart…”chocolate”. Yep, the single greatest thing or treat they know of is chocolate. 😮 Unfortunately I didn’t have any but luckily Sarah did and turned their unhappy faces into happy smiley faces again. Get to where the bus is and it’s chaos! The rest of our group are there but we’re surrounded by locals trying to flog their wares – t-shirts, music CDs, crafted ornaments and one particularly dodgy chap offered me a baton with a 12″ blade hidden inside?! Also more children here asking for chocolate and when offered any it was literally snatched from the hand at light speed! I’m pretty sure one of those kids is stashing it all and using it as some sort of black market currency! Arrive back at the lodge at 16:30 ish. Shown to my lodge where I promptly take a shower. Only my OCD kicked in and instead I emptied my clothes on the floor, arranged and folded into piles and then packed into my suitcase! As soon as I had satisfied the OCD tendencies, I took a shower and it was amazing! Clean, smelling nice and in comfy clothes, I trotted off to the main lodge to get some wifi (and a Kili beer!) and send some messages out letting everyone that I was alive and had made it to the summit. As the evening drew on members of the group retired to bed and some final goodbyes were said; another emotional bit of the trip as we all bonded well and without the dynamics of the group the trip wouldn’t have been anything like it has been. A final goodbye was said to Makeke (the big potato! ); without his personality, his…everything, I’m not sure how many of us would’ve made it! We did it! We reached the summit of tallest free standing mountain in the world! Bring on the tears; Sarah, Margaret and I all had to stop and have a little tear (I’m welling up now!). I think it was a culmination of tiredness, the most challenging thing we’ve ever done and, for me, missing my little family. Set off at midnight; 15 minutes in and we had to stop for people to remove layers! Not much to say really other than it was dark, cold and flipping hard! As we were about half way through the relentless and endless switchbacks up to Stella Point I hit the wall. I tried various things – eating chocolate, drinking water etc – but my legs just did not want to take another step! So 4 hours in and I’m walking slower than a snail! I sat at a break stop and if I’d closed my eyes I would’ve been in Neverland in seconds! Thankfully one of the guides (Dale) took my rucksack and encouraged me along the rest of the way. Had it not been for him I probably would’ve just called it a day and regretted it for ever more. At just before 07:00 on 25th August 2016, we reached Stella Point (5745m) and were treated with an amazing sunrise. A short, but hard, 45 minute walk up to Uhuru (5985m) saw us standing on top of Africa basking in glorious sunshine and not a cloud in site! Lots of photos ensued and then we started back down again – 30-40 minutes at 50% less oxygen is plenty for anyone. 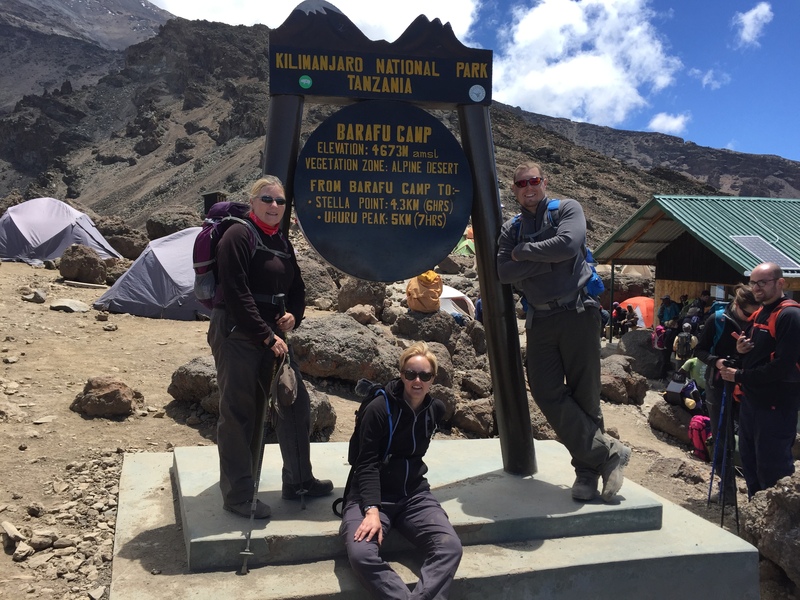 Got back to camp around 11:00 with Sarah and Margaret shortly after; Sarah I think was struggling with a headache brought on by altitude…or a lack of sleep?! Walk to camp took about 2.5 hours of steady descent arriving at 15:30. Now where’s my Washy washy bowl?! Afternoon tea of popcorn and then back to the tent for a rest. We’re all still trying to process the fact that we all made it to the summit. Still, after days of walking up, not quite believing it’s all done and all that is left is to walk down. Dinner consisted of potato, beef and banana stew with pineapple for desert. I treated myself to the Snickers bar that I bought for summit night but forgot to eat…amazing! Now to bed after being up for nearly 24 hours! Hopefully a good night sleep ready for our 4-or-so hour walk to Mweke gate and the end of our journey. Not a great nights sleep tonight. Hearing Emily falling into toilet tent didn’t help! Normal wake up routine of wake up call, dress, pack, fill water containers and then meander to the mess tent. Leave camp around 08:30 and set off up a relentless up hill trail for an hour until we break – approx 4200m. Steady pace (led by Makeke) with one more break at the foot of a climb up to Barafu. A 45 min hike up the last leg of the trail and through a crowded camp to our tents – Allan (my porter) has picked out a great spot again! Quick rest before lunch – soup, chips (😊), sausage kofta thing and water melon. Then a briefing about tonight and words from other guides. An early dinner (17:30) of potato stew and rice. Back to my tent again to lay clothes out underneath sleeping bag and to try and sleep (it’s 18:40!) before the wake up call at 23:00 for the big day. Normal routine of wake up call, washy washy, dress and pack bags. Barranco wall – looming over us as we start to climb…scramble really…although there are porters passing us at lightning speed carrying and balancing equipment on their heads! Crazy fools. It takes nearly two hours to get to the top – 4219m – after a couple of stops and a couple of false summits! Here we take some photos, enjoy the views and have a couple of snacks. We descend from the top to start the trail to Karanga; a couple of hours later we’re descending into the valley (3946m) and stop for an “email” break at the bottom. A quick 30 minute-or-so climb back out of the valley to camp – 4034m – arriving at 13:30. Short rest before our acclimatisation walk up to 4200m at 15:30. Cleaning teeth while looking out over a sea of stars and, surprisingly, civilisation! Several towns light up the night floor while the stars and milky way light the sky. I thought I was lucky seeing a shooting star last night to wish on, but tonight I caught the most amazing shooting star! It literally stopped me in my tracks as it streaked down the west side of Kibo! It seemed so close…not your normal shooting star! Tough-ish walk over the ridge and then through Shira plateau and on to Lava Tower (4650m); very tough and cold with a little snow and hail falling from the clouds. Another Yummy packed lunch at Lava Tower before a fairly rapid and tricky descent. Washy washy time! That bowl of hot water is fast becoming a welcome sight thanks to the dust that just wont disappear…I wonder if the summit is more dust, just forzen in place? Impressively, my phone has made it to this point without needing a charge! It’s now at 17% so on charge it goes.